On Wednesday, October 14, 2015 the Cultural Resource Management and Protection Branch (CRMPB) received a call from Mohamed Kadasi, an engineer with the Fairfax County Utilities Design and Construction Division (UDCD). 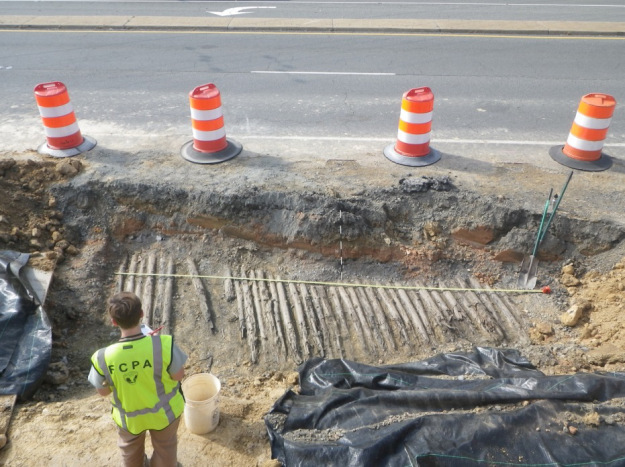 Kadasi thought that excavations for a shoulder and sidewalk improvement project near the City of Fairfax might have unearthed a historic resource. Backhoe trench excavations had struck an old, buried macadam surface. When that was lifted it exposed a cedar log road. Ken Atkins, senior inspector with UDCD, had the construction team very carefully remove the macadam so as not to disturb the logs. Inspector Atkins is very interested in history and wanted to make sure that the past was not lost. His fast action and the care taken to not impact the logs were absolutely invaluable in understanding an important part of Fairfax County history. It’s about as far as you can get from Charleston on a tank of gas.